Specifically designed for sensitive skin, Comfort Pure Fabric Conditioner 5L is dermatologically tested. Safe to use for all the family, developed using skincare research recognised by the British Skin Foundation. Comfort Pure keeps fibres smoother for outstanding softness that feels gentle against sensitive skin. Gentle and delicate on babies? skin, Comfort Pure Fabric Conditioner is great for you and your little ones. Add it to your washing, along with your favourite laundry detergent, for clothes that are softer and easier to iron. The UK?s number one fabric conditioner (AC Nielsen Dec 2017), Now available in an ultra-concentrated format. Comfort Pure Hypoallergenic Fabric Conditioner 5L. Comfort Pure Hypoallergenic Fabric Conditioner 5L keeps clothes soft and is gentle on skin. This gentle yet effective fabric conditioner for sensitive skin is dermatologically tested and perfect for your baby?s skin. Suitable for the whole family, Comfort Pure leaves your clothes with a delicate long-lasting fresh fragrance. Hypoallergenic and dermatologically tested with skincare research recognised by the British Skin Foundation, Comfort Pure is perfect for babies? soft skin and also for adults with sensitive skin or allergies. All that, plus it still gives you long-lasting fragrance. No wonder it?s the number one fabric conditioner for mums (Based on AC Neilsen data 25/12/17). How to Use: 1. Pour a 35ml dose straight into the correct compartment of your washing machine drawer along with your favourite laundry detergent. Do not pour directly on to fabrics. 2. Choose the right wash setting and let your machine take care of the rest, as it releases the fabric softener during the final rinse cycle. Using Comfort Pure in every wash helps keep fabric fibres smooth, making your clothes easy to iron and gentle on delicate skin. 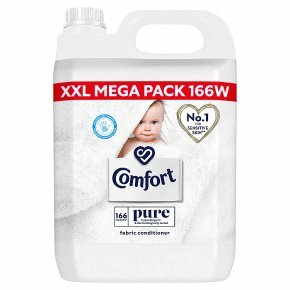 Keep your clothes soft and your little one?s skin happy by using Comfort Pure Hypoallergenic Fabric Conditioner 5L in every wash. With a formula that?s designed to be gentle to sensitive skin and a delicate fragrance that leaves your clothes smelling fresh, this sensitive fabric conditioner is the perfect choice for your family.